STOKE Easy Rider Potters went down to a 55-39 defeat in the first leg of their National League Knock Out cup semi final against the Mildenhall Fen Tigers at West Row on Sunday evening leaving them with a mountain to climb in the second leg at Loomer Road next month. The Easy Rider Potters fell behind in the opening heat as the Tigers gained a 4-2 from Lewis Blackbird and Joe Jacobs over Potters guest Charles Wright. Stoke then kept it close with drawn heats in the next three races with Liam Rumsey gaining his first win in Potters colours with victory in heat two as the Potters were left trailing 13-11 after four heats. Mildenhall extended their lead to six points with two 4-2 heat advantages in the next two heats firstly from Stefan Nielsen and Daniel Halsey over Wright and then Nielsen who grabbed his second race victory on the bounce and Jacobs over James Cockle before Potters skipper Tony Atkin and Rumsey stemmed the tied packing in for a drawn heat behind Blackbird to leave the Potters trailing 24-18 at the halfway stage of the meeting. The Potters then suffered two maximum 5-1 heat advantages against them to leave them trailing by fourteen points before Atkin and Liam Carr stopped the rot with a drawn heat in heat nine with the Tigers leading 37-23 after ten races. Easy Rider Potters team manager Malcolm Vasey introduced Charles Wright as a tactical rider in heat ten, but it was Blackbird that got the better of Wright to take victory with Ryan Terry Daley getting the better of Rumsey who fell for a drawn 4-4. With the Potters still trailing by fourteen points Vasey nominates Atkin as a tactical ride in heat twelve with Liam Carr coming in as a reserve ride. Stefan Nielsen took the chequered flag for the Tigers but Atkin and Carr packed in the minor positions giving the Potters a 5-3 heat advantage leaving the Potters trailing 44-32 after twelve heats. The Tigers then extended their lead in the next two heats with 4-2’s from Blackbird and Jacobs and then Daniel Halsey and Terry Daley to leave the Potters trailing 52-36 with one heat remaining. 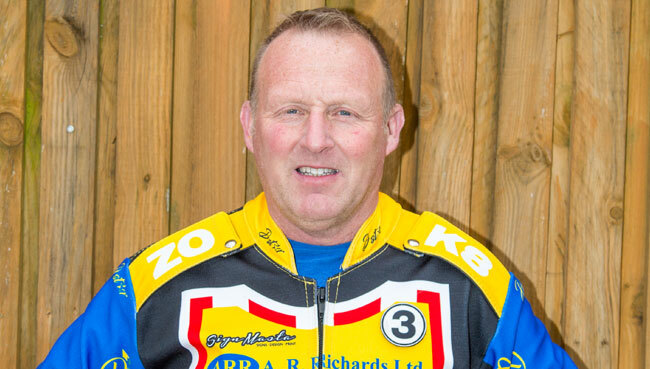 Nielsen took victory in heat fifteen ahead of Wright and Atkin after Blackbird had been disqualified for falling in the final heat to give the Tigers a 55-39 victory over the Potters. MILDENHALL 55: Stefan Nielsen 18, Lewis Blackbird 15, Joe Jacobs 9, Daniel Halsey 6+1, Ryan Terry Daley 4, Josh Bates 3+2, Cameron Heeps R/R.